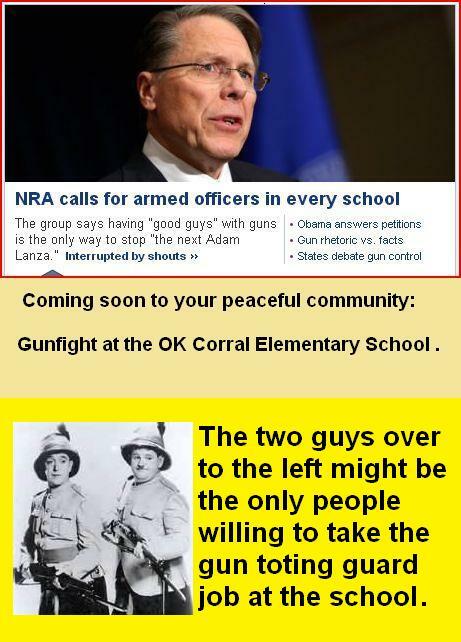 The NRA's solution to school mass killings---it's worth a good laugh. The National Rifle Association released its opinion on how to stop mass killings. To me, it sounds like a modern day "Gunfight at the OK Corral" just waiting to happen. So the NRA is stating that an armed police/guard with a gun, sitting comfortably in his elementary school reclining chair is going to stop a fruit-loop, dressed in bullet-proof clothes, spraying the entire building with bullets fired from weapons of mass destruction. All this means is that the first person the mass killer will plan to kill is the person at the school being given the task to stop the froot-loop with the military weapon bent on killing everybody in his view before he calmly puts a single bullet into his head. Does this get any crazier?